We want to hear from you. Click on the flyer to complete the survey! . The mission of the CAICC Education Committee is to provide, advocate and support an inter-tribal urban system of education, through networks of Native American Programs and other providers to increase academic and career success for multi-generations which recognizes formal education and tribal cultures/traditions. The CAICC Education Committee meets the second Thursday of each month at 10:00 a.m., at the American Indian Association of Illinois, 6554 N. Rockwell, Chicago, IL 60645. For more information, contact chairs Melanie Cloud or Jasmine Gurneau or education@chicagoaicc.org. 3rd annual CAICC Urban Native Education Conference to be held on May 3-4, 2019 at CPS Garfield Park Office, 2651 West Washington Blvd, Chicago, IL. For more information, including a call for proposals, visit here. Hosted 1st and 2nd annual Urban Indian Education Conferences. Developed research and outreach strategies to pursue passing federal and state policies to fund urban American Indian education programs. These discussions began with the Mayor’s office in FY’15. Established a new Chicago-based education committee and built a shared education vision for Chicago. Expanded communication between all education programs and services through the increased writing of articles, flyers, social media announcements and other communication. This included the publishing of a monthly calendar of community events by CPS’s American Indian Education Program and the development and updating of a Facebook group page by AIAI and the contribution of information and design ideas for the CAICC website. 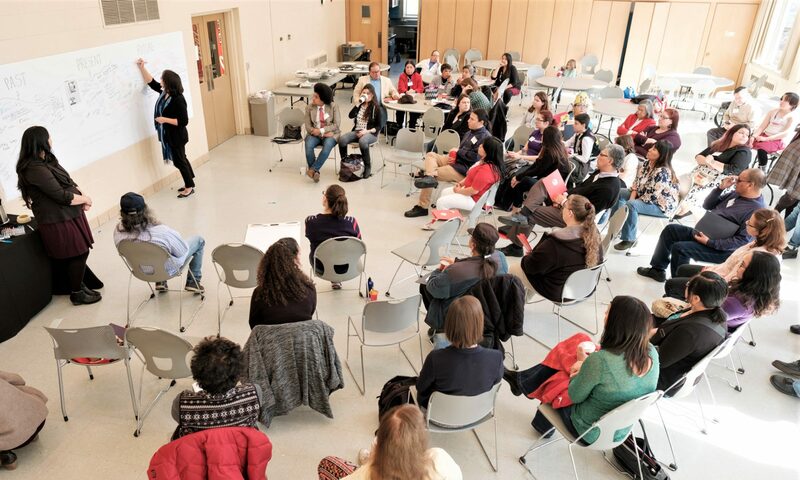 A new expanded youth focus was established in FY’15, with Title VII, AIAI, Kateri, and community initiatives such as Chi-Nations and Native Scholars working to increase their outreach and programming to serve more youth. This culminated in a three day Chicago Youth Summit on April 6-8, 2015, held at Title VII with speakers from over seven different organizations and universities. A new oral history program began in collaboration with the Northwestern University, Journalism department, which will add transcripts and videos to the traditional knowledge base of Chicago. 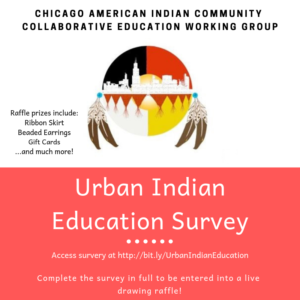 The CAICC Education Committee is made up of American Indian educators, parents and students who represent educational organizations and programs at all levels serving American Indian people in the Chicago area. All members of the community are invited to attend monthly educational meetings and become involved in the extensive assortment of programs and services available through this network of educational providers. American Indian Health Services of Chicago, Inc.